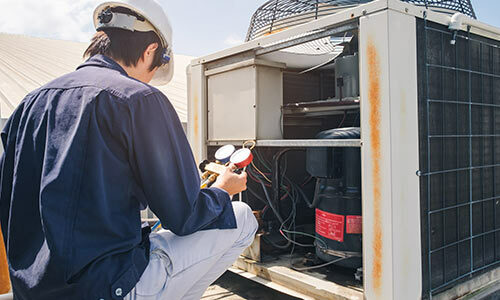 Hometown Comfort’s Preventative Maintenance Agreement will not only increase the usable life of your equipment, but it will also improve the seasonal efficiency. This will result in shorter run time and less energy consumption. Preventative Maintenance will also improve indoor air quality and comfort. 10% discount on all parts if an event occurs in between visits. Note** This Preventative Maintenance Program does not include issues caused by wildlife, lightning, and/or “acts of God”. The discount stated above will NOT be offered for negligence (ex: not using filters and/or not changing regularly). Check performance of all major components, lubricate moving parts (if applicable), check refrigerant charge, check for oil and refrigerant leaks, check operating and safety controls, check pressures and temperatures, inspect condensers, fans, motors, and starters, tighten electrical connections at equipment, test amperages and voltages, check belts, drives, change 1 inch disposable filter (if necessary), thoroughly inspect and clean heat exchanger, clean condenser coil and evaporator coil. Note** If the homeowner chooses NOT to have suggested items replaced or repaired at the time of service and technician is called out between visits, homeowner is responsible for the repair and the service call. If homeowner has an issue between visits and the issue was NOT found at preventative maintenance checkup, homeowner will receive the “The Benefits of a Preventative Maintenance Program”. (See Above Section). Customer may cancel this agreement by mailing a written notice of cancellation to Hometown Comfort. In the event of cancellation, the customer shall receive a prorated refund of the payments made by customer for the current term of this agreement. The system has not been used solely for the purpose under the condition for which it was designed, or the system has been subjected to misuse, alteration, accident, or abuse. Customer has any part of the heating and/or air conditioning system serviced by a company other than Hometown Comfort. Customer fails to fulfill the payment terms. All reasonable attempts will be made to schedule your appointments in a timely manner, including phone calls, postcard reminders, and email (if on file). This agreement is for two service tune ups within a one year period. Note** If the property is a rental property, Hometown Comfort will need the tenants name and phone number to let them know what day a technician will be on the property. If a scheduled time is canceled with less than 24 hours’ notice, a ½ price service call will be charged ($30). This agreement is transferable to the subsequent owner of the home in which the equipment and accessories are located, provided that Hometown Comfort receives notification of the sale of the property within 15 days of the transfer. The new owner will be responsible for payments. For 1 unit – $15 / month auto drafted through QuickBooks or paid in full each year. For 2 units – $18 / month auto drafted through QuickBooks or paid in full each year. For 3 or more units – please call for pricing. If you are interested in taking advantage of this Preventative Maintenance Agreement, please give us a call or fill out the below form.